تحول در روابط اجتماعی همواره می‌تواند برتری مردان بر زنان را به چالش بگیرد. با پدیدار شدن «گرایش به بحرانی»، مردان به یک ایدئولوژی جدید نیاز خواهند داشت که همچنان مشروعیت پدرسالاری را حفظ کند. این ایدئولوژی یک «مردانگی ایدئال» عرضه می‌کند که الگوی «بهنجار» مردبودگی را دوباره تثبیت می‌کند. 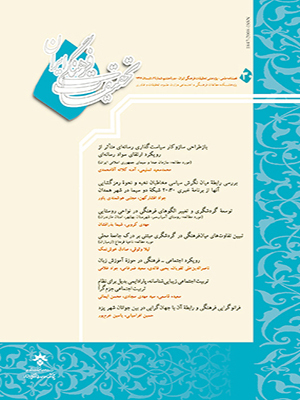 ریوین کانل این «الگو» را مردانگی هژمونیک نامیده و معتقد است به دلیل پایان‌ناپذیر بودن فشار عوامل مشروعیت‌زدا، مردانگی هژمونیک همواره در حال تحول خواهد بود.این پژوهش با استفاده از نظریه کانل و روش کیفی (سنخ ایدئال‌سازی وبری) در ابتدا از فیلم‌های سال‌های اولیه انقلاب و ارزش‌های انقلابی که در آن سال‌ها تبلیغ می‌شد، یک «سنخ ایدئال مردانگی سنتی» برساخته و سپس ارزش‌های مردانه‌ای را که در پُرفروش‌ترین فیلم‌‌های سینمایی سال‌های ١٣57 تا ١٣٨8 مورد تأیید و تشویق بوده‌اند با آن سنخ ایدئال مقایسه کرده است. از مقایسه 32 سنخ ایدئال به‌دست‌آمده، چهار دورة متمایز مشخص شده و سنخ ایدئال هر دوره برساخته شد. نتایج حاصل از مقایسة آنها با هم نشان‌دهندة صادق بودن نظریة کانل در مورد تغییرپذیری مردانگی هژمونیک همگام با تحولات اجتماعی است. Baker, T.L. (1381 [2002 A.D]) Nahve- Anjâm Tahqiqât Ejtemâee (Persian Translation of Doing Social Research), Translated by Hoošang Nâebi, Tehrân: Entešârât Sorooš. Branaman A. and Lemert, C. (1997) The Goffman Reader, Oxford: Blackwell Publication. Charlebois, j. (2009) “Cross-Cultural Representations of Hegemonic Masculinity in Shall we Dance”, Journal of Intercultural Communication, Vol.- (19): 1-16. Connell R. W. (1997) “Politics of Changing Men”, Australian Humanities Review, Vol. (4): 1-12. (2005) Masculinities, Berkeley: University of California press. (b) (2005) “Change among the Gatekeepers; Men, Masculinities and Gender Equality in the Global Arena”, Signs, Vol. 30( 3):1801-1825. Connell, R. W. & Messerschmidt J. W. (2005) “Hegemonic Masculinity: Rethinking the Concept”, Gender & Society, Vol.19 (6): 829-859. (1987) Gender and Power, Oxford: UK: Polity Press. (1996) “Teaching the Boys: New Research on Masculinity, and Gender Strategies for Schools”, Teachers College Record, Vol. 98 (2): 206-235. (2002) Gender, Cambridge: UK: Polity Press. Connell ،R. W. and Wood J. (2005) “Globalization and Business Masculinities, Journal of Men and Masculinities, Vol. 7( 4): 347-364. Donaldson, M. (1993) “What Is Hegemonic Masculinity?”, Theory and Society, Vol.- (22): 643-657. Dyer, R. (1382 [2003 A.D]) “Badanhây-e Âsmâni: Setâregân Sinamâ va Jâmeeh” (Persian Translation of Heavenly Bodies: Film Stars and Society), Translated by Nimâ Malekmohammadi, Arqanoon, Vol.- ( 23): 253-275. Eslâmi, M. 9 1384 [2005 A.D]) Mafâhim-e Naqd-e Film (Persian Translation of The Concepts of Film Review), Tehrân: Našr-e Ney. Gergen, M. and Davis, S. D. (1997) Toward a New Psychology of Gender: A Reader, New York: Routledge Publication. Giddens, A. (2005) Sociology, London, Polity press. Huaco, G. (1361 [1982 A.D]) Jâmešenâsi Cinamâ (Persian Translation of Sociology of Cinema), Transalted by Behrooz Toorâni, Tehrân: Našr-e Âeeneh. Jâvdâni, H. (1381[2002 A.D]) Sâlšomâr Târix Sinamây-e Irân (Persian Translation of History of Iranian Cinema), Tehrân: Našr-e Qatreh. Lingard B. and Douglas P. (1999) Men Engaging Feminism, Buckingham: Open University press. Mellen J. (1978) Big Bad Wolves: Masculinity in the American Film, London: Elm Tree Books. Mirzâei, A., Zokâei, M.S. (1384 [2005 A.D]) “Pesarhây-e Javân va Arzešhây-e Mardânegi” (Persian Translation of Young Boys and masculine Values), Nâmeh Oloom-e Ejtemâei, Vol.6 (3): 70-96. Moallem, M. (1383 [2004 A.D]) “Mardânegi dar Bonbast: Gâvxooni, Lahzei barây-e Taamoq dar Hoviat Jensi” (Persian Translation of Masculinity in Blind: Gavkhooni, A Minute Thought on Sexual Identity), Mâhnâmeh Sinamâee Donyây-e Tasvir, Vol.- ( 135): 88-89. Perriam, C. (2003) Stars and Masculinities in Spanish Cinema: From Banderas to Bardem, Oxford: Oxford University Press. Rutherford, J. and Chapman R. (1998) Male Order: Unwrapping Masculinity, London: Lawrence & Wishart. Santrock, John W. (2001) Adolescence, New York: Mc Graw Hill Inc.
Šarâbi, H. (1380 [2001 A.D]) Pedarsâlâri Jadid (Persian Translation of Neopatriarchy), Tranlated by Ahmad Movaseqi, Tehrân: Entešârât Kavir. Sârooxâni, B. (1381 [2002 A.D]) Jâmeešenâsi Ertebâtât (Persian Translation of Sociology of Communications), Tehrân: Entešârât Etelâât. Soltâni, M., Rahmati, M. (1386 [2007 A.D]) “Šivehây-e Bâznamâee Jensiat dar Sinamây-e Irân” (Persian Translation of The Methods of Gender Representation in Iranian Cinema), Faslnâmeh Ertebâtât va Farhang, Vol.- ( 10): 79-85. (1382 [2003 A.D]) Axlâq-e Protestân va Rooh-e Sarmâyehdâri (Persian Translation of The Protestant Ethic and the Spirit of Capitalism), Translated by Abdolkarim Rašidiân & Parisâ Manoočehri, Tehrân: Entešârât Elmi Farhangi. (1382 [2003 A.D]) Raveššenâsi Oloom-e Ejtemâei (Persian Translation of Methodology of Social Science), Translated by Hasan Čâvošiân, Tehrân: Našr-e Markaz.